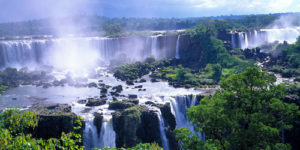 Iguaçu Falls, photo by Embratur. RIO DE JANEIRO – Once sure that Brazilian real estate represents a good investment, you must decide the principal purpose of buying land in Brazil. Do you want to obtain permanent residency, a holiday home, generate rental income or a land investment on a mid to long-term basis? There are no restrictions (except in relation to vast swathes of agricultural land) on foreigners buying land in Brazil in their own names. However, if you do buy any land without applying for permanent residency, be aware that you will be, strictly speaking, limited to spending a maximum of six months a year in Brazil – that is three months from entry and a further three on an extension granted by the Federal Police. Although the principal purpose is largely a matter of personal choice, there is still some guidance that can help you to better navigate the bureaucracy. Once you have decided on the purpose of buying land in Brazil, you will then need to find the correct means for doing so. Land in Brazil is subject to State Registration. The location of the local Land Registry can be found in the offices of the Prefeitura. It is necessary, having found a property to purchase, to have searches done in the court system and Company Registry to find out whether the title is encumbered by unpaid taxes, law suits against the owner (whether an individual or a company) or any dispute as to its title. It is important to exercise the utmost care and never could the Latin maxim caveat emptor (let the buyer beware) be more relevant. Estate agents in Brazil must be members of a professional organization and carry a membership and identification card with a ‘CRECI’ number, demonstrating their qualifications and right to practice. Every agent should be able to produce their card on request for inspection. 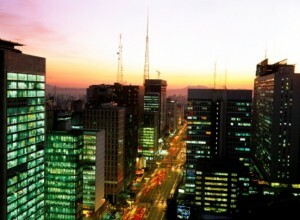 São Paulo city lights, photo by Embratur. If you are buying property through a Brazilian company established by you for the purpose of securing permanent residency, it is of the utmost importance that you follow procedures prescribed by the Banco Central do Brasil for the transfer, tracing and certification by the Banco Central of the money. The capital must come from abroad and demonstrably be an inward investment by you in your Brazilian company. Except for dependents, the minimum amount of investment in the company per person is the equivalent of US$50,000. On sums brought into Brazil by bank transfers, there is a tax of .38%. In the past you had to invest US$250,000 and employ at least ten Brazilians to qualify for permanent residency status. However, this has been lowered to the level stated along with the waiving of the employee clause. Some professionals here have not caught up with this change and you need to be on the lookout to ensure that the advisers you hire are up to date with the latest changes. The Brazilian legal profession is, like the profession in North America, a unified profession of advogados (lawyers) who are theoretically qualified to handle both court work and paper work. When you hire a Brazilian lawyer, be prepared for the fact that many of them set Gringo levels of fees for foreigners, which few but the richest Brazilians could afford. You may find yourself paying as much as (maybe more than), rates payable in Western Europe and North America to effect even simple land transactions. thanks for this interesting article. Regarding the investor visa you state: “….along with the waiving of the employee clause.” I obtained the investor visa last year in september (2008) and transfered 50 kUS$. I was told by my quite knowledgeable agent I should hire some people (which I do not need in my industry BTW – I prefer to hire freelancers). Hence naturally I’d like to know the source of your information regarding the waiver of employement requirements. Can you contact me directly as this is likely not of public interest? I don’t know how I can contact you direct. The law was changed from an investment of US$250,000 to US$50,000 and the need to employ 10 Brazilians was removed. Some professionals do not seem to know of this change. But, even so, the process can take so long that, in more than one case that I know of, the applicants for investor visas have now applied for amnesty visas instead (and got them) after spending many thousands of US$ on immigration ‘experts’. if you buy to rent be very careful to research any long term tennant carefully, if they leave property tax or condo fees unpaid you can get a lawsuit to pay all bills even if in contract the tenant had to pay. By law in Brazil those debts belong to the property, so the owner has to pay in the end. It is not easy to evict tenants here. You have to go through the courts and it takes a long time and cost a fair ammount of money. An meanwhile the tenat will live there and you will still be paying the bills. It is hapening to me at the moment. The case is in the courts since Dec 2008 and I am in debt because of the tenant. And it happened bercause of bad administration. I was out of the counrtry and in here some people ca get slack if you are far away. any problem the Porto insurance will pay the bills if the tenant does not. So even if the Estate Agent has a CRECI it does not mean they are good or efficient. Ask people you know well. I thought I read one of the recent articles in here that buying property does not give permanent status after a law change this year. Could you please confirm either way? I can’t get the amenisty visa as I had a works visa valid before the 1st Feb qualifying date so I am trying to research other routes. My understanding is you can invest in real estate if you do it through a corporation. I have a lawyer in rio who is reasonable and good. I don’t think he speaks English though. Buying isn’t a problem its straight forward, but this article is saying/indicating that a property or land purchase will lead to permanent visa status, on my findings thus far this clearly is not the case after the law changes earlier this year. Can you be more specific. What law change are you referring to?